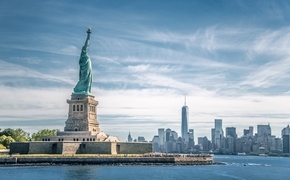 I’ve had the good fortune to travel around the world on cruise ships as a writer and public relations professional, and most recently throughout the Western Hemisphere as an editor covering the Caribbean and Latin America. But in earlier professional days I visited U.S. cities including Dallas, Chicago, Miami and Los Angeles. It was then I learned first-hand how diverse and inspiring traveling the United States can be. This week I received more experience on a drive from Fredericksburg, Va. to Portales, N.M., where my son Derek this week starts a new job as assistant managing editor of the Portales News-Tribune, a local newspaper and media company. Derek most recently was a sports and news reporter in Martinsville, Va. After he informed me he’d accepted this new position, like any dad I wanted to make sure the job was right for him and see he could reach there safely. Derek is in his mid-twenties, a Penn State graduate, and has worked in journalism for a few years now. But New Mexico is a long way away. 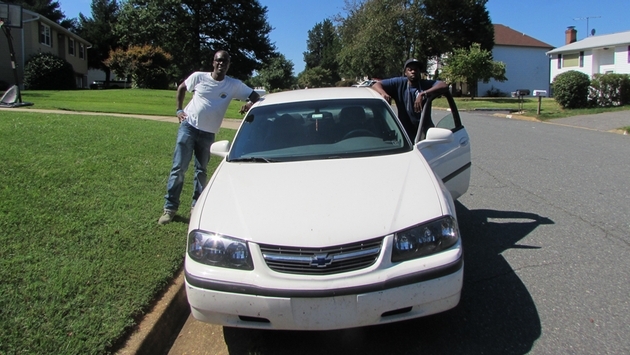 He’d have to drive his car and his possessions 1,667 miles to the new city and re-start his life in a community guaranteed to be quite distinct from anything he or I had experienced. While he’s a smart young man who grew up in New York City and has traveled internationally, if this all worked out I wouldn’t be seeing him again very soon. I also just didn’t want him driving all that way alone. So after talking it over with my wife I opted to drive with him. So Derek and I met on Friday at my sister’s ranch-style home in historic Fredericksburg, Va. During the Civil War this city represented the midway point between the Northern and Southern capitals. Some of the war’s bloodiest battles, most notably the Battle of Fredericksburg and Second Battle of Fredericksburg, were fought here. 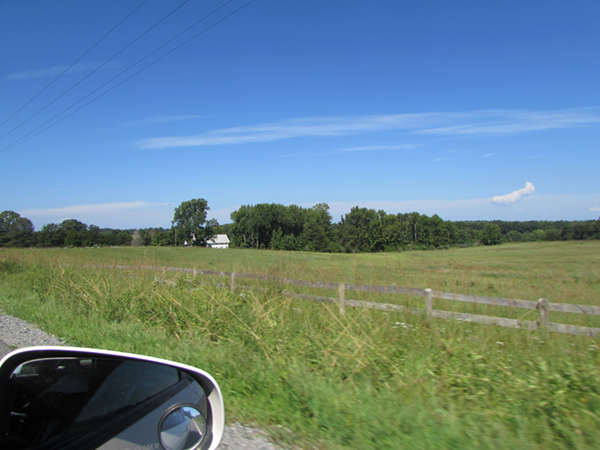 Thus we began our drive on a solemn note, passing the Wilderness and Chancellorsville battlefields on our way to Route 40 west. The vast green fields’ present-day peacefulness is hauntingly ironic and belies the reality that conflict endures across our world. PHOTO: The Chancellorsville battlefield in Spotsylvania County, Va.
Our itinerary was to take us from eastern to western Virginia and through virtually the entire states of Tennessee, Arkansas and Oklahoma. The drive would then continue across Texas' panhandle to Portales in New Mexico, about one hour from Roswell (more on that later). Derek was due to begin work on Thursday, so while we hoped to encounter new sights and experiences, this was no leisurely drive. We left early Saturday afternoon and pretty much covered Tennessee and Arkansas that day and night. I remember driving past Nashville's skyline late Saturday, thinking it an impressive and colorful sight framed against the night sky. I’d certainly like to return someday. Along the way we encountered road signs featuring some of the intriguing names you’ll find anytime you cross our country. In Virginia we passed Shot Tower Historical State Park and later Hungry Mother State Park, both of which have interesting origins in fact and legend. In Arkansas we spotted Pig Trail Recreational Area and noticed two large fireworks stores the size of urban supermarkets. Derek and I wondered aloud who was purchasing all of these fireworks. Somewhere between Arkansas and Oklahoma we pulled over at a highway rest stop and slept for a few hours. Then we started up again, driving with the sun rising behind us as we traversed into Oklahoma. The state’s Native American legacy is evident even from the highway, as road markers indicate the borders between the Cherokee, Creek, Seminole and Citizen Potawatomi nations. 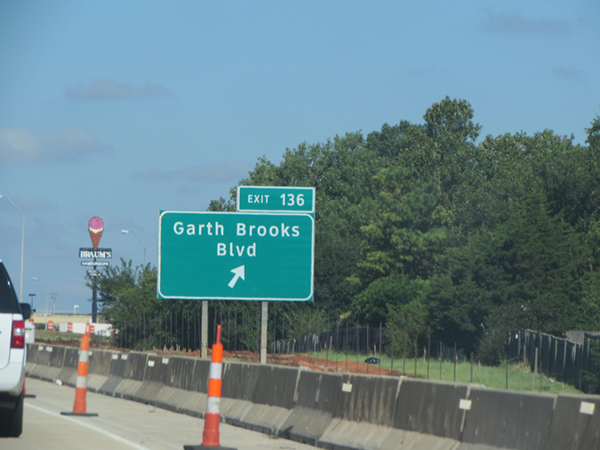 Our schedule did not permit a visit to the “Choctaw Home of Carrie Underwood” and we also continued past exit 136, which takes drivers to Garth Brooks Boulevard. PHOTO: Exit 136 in Oklahoma. In Oklahoma, the horizon widened and we could see massive wind farms jutting up in the distance like white toothpicks across hundreds of miles of vast plains. Brilliant blue skies framed hundreds of immense, pillow-like clouds that stretched across the endless sky. We drove past impossibly large farms with hundreds of hay bales rolled precisely into huge cylinders, and saw ranches filled with fields of cows and steer. Perhaps it will disappoint some, but we shared few of the relationship watershed moments so often depicted in the movies. That isn’t to say we didn’t talk. On the contrary, we discussed music, the difficult state of the present-day New York Yankees, the emergence on video of a certain National Football League player committing a cowardly act, and the irony of today’s journalism, where a celebrity web site is among the top news-breaking organizations. We also talked about what life might be like out west, and what was happening in Brooklyn, as Derek hasn’t been home in some time. The best part was that we were together. The 75 mile-per-hour speed limit across much of the Texas panhandle pushed us along past Hereford, the "Beef Capital of the World," where we were stared at towering grain elevators positioned beside freight rail lines on high ridges. Groups of as many as five engines linked together pulled and pushed trains of 100 cars and more. Further down the road, massive pens the size of several football fields held thousands of cattle. It’s hard not to believe America is an agriculturally important nation after witnessing such sights. 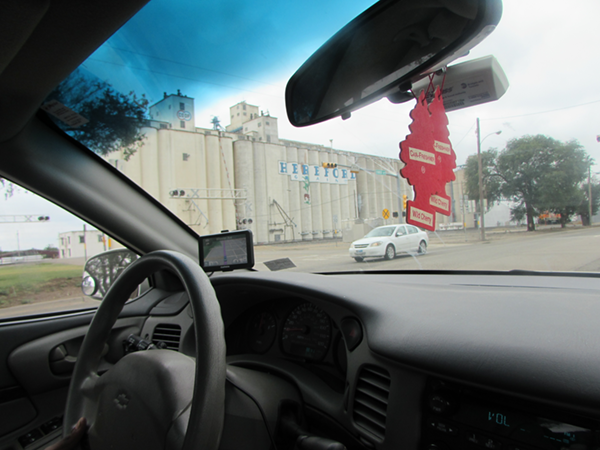 PHOTO: We spotted huge grain elevators in Hereford, Texas. Our entry into Mexico was relatively unassuming, marked mostly by yellow road signs that welcomed us to the “Land of Enchantment.” Suddenly while driving through Texico, another agricultural-center-type New Mexcio town, we were pulled over by a local sheriff. He informed us Derek was doing 43 in a 35 mile-per-hour zone. The sheriff was a polite Mexican gentleman who checked Derek’s license while we informed him of the nature of our trip. He smiled, handed back the license and wished Derek luck in his new job, warning him to watch his speed. 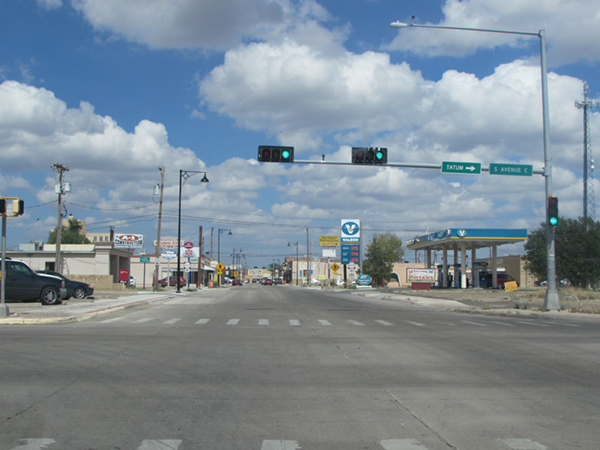 Later that afternoon we finally reached Portales, the city of 12,280 where my son has embarked on the next phase of his journalism career. It’s a small and friendly place where we checked into a local hotel. The next morning I accompanied Derek as he met with the newspaper’s editors and then picked up the keys to his apartment. We moved his things into the one-bedroom apartment on a quiet street, and later enjoyed a meal at a very pleasant local restaurant. PHOTO: We arrived safely in Portales. The only moments of real apprehension came the next morning, as we drove from Portales to Roswell International Air Center, a distance of about 100 miles. I would fly home to New York from here, connecting with a flight in Dallas. Derek didn’t show any particular concern but for me the drive along Route 70 West was an increasingly nerve-wracking experience as we zoomed across a barren stretch of shrubby grassland and literally not much else for hundreds of miles around. This was not the place to have any sort of car trouble. At one point we passed through Elidia, a ghost of a town with what seemed like only one occupied building along its lonely main street. Elidia has a population of 183 people according to the 2000 U.S. census. Another 30 or miles west along another empty stretch we spotted two vultures feeding on something in the center of the roadway. As we moved closer (at 75 miles an hour) the vultures didn’t. They stayed right there, picking at their meal. Derek started to slow down. Finally about 15 feet from the car Derek and I braced for impact as they suddenly flew up and away. Fortunately the huge birds had escaped in time. About 25 minutes later I was glad to reach the airport. Derek and I said our goodbyes and I wished him luck. I made sure to ask some folks at the airport where he could find a nearby gas station, and I ordered Derek to fill up before driving back. Hopefully I’ll see my son again around the holidays, but whenever it is I won’t soon forget our drive across the country.